KUALA LUMPUR (Nov 13): Sime Darby Bhd's proposed privatisation of plantation firm New Britain Palm Oil Ltd (NBPOL) may not materialise after the Papua New Guinea (PNG) government indicated its intention to up its stake in NBPOL. According to Sime Darby President and Group Chief Executive Tan Sri Mohd Bakke Salleh, the PNG government intends to increase its stake in NBPOL from 18% to 30%. Bakke said the move was good for Sime Darby, which could still end up with a controlling 51% stake in NBPOL. "Definitely, we would like to work with the authority and PNG government to grow the business," Bakke told reporters after Sime Darby’s annual general meeting here today. Bakke said to own a 51% stake in NBPOL "is ideal" for Sime Darby. To recap, Sime Darby had last month (October) indicated it would make a take-over offer for the entire 100% stake in NBPOL for £1.07 billion (about RM5.7 billion) cash. 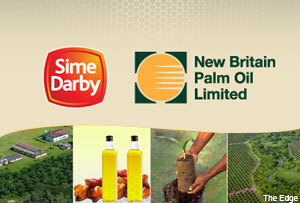 The proposed privatisation of UK and PNG-listed NBPOL will see Sime Darby delisting NBPOL from the UK bourse.